Fault Detection Variants of the CloudBus Protocol for IoT Distributed Embedded Systems, BARKALOV, A., TITARENKO, L., ANDRZEJEWSKI, G., KRZYWICKI, K., KOLOPIENCZYK, M.
A New Optimized Model to Handle Temporal Data using Open Source Database, KUMAR, S., RISHI, R.
Highly Efficient, Zero-Skew, Integrated Clock Distribution Networks Using Salphasic Principles, PASCA, A., CIUGUDEAN, M.
TUTUNCU, K. , DEMIRCI, B. Image steganography is a technique to hide secret information in an image without leaving any apparent evidence of image alteration. Hiding capacity, perceptual transparency, robustness, and resistance against attack must be considered as characteristics of the image steganography algorithms. In this study, Improved Chaos Based Bit Embedding has been proposed as a new steganography algorithm. It is based on two basic principles. One of them is determining the bits in which the secret data will be embedded by logistic map and the other one is embedding the secret data into only one of the three color channels that is chosen randomly. It distorts the other remaining channels so that it is harder to obtain the text within the image by an unwanted person. The proposed algorithm has been tested on 10 sample images along with the four basic steganography algorithms: Least Significant Bit Embedding, Pseudo Random Least Significant Bit Embedding, EzStego, and F5. It has been seen that generating unpredictable indexes by the chaotic random number generators, and embedding the secret data into only one of the three channels (distorting remaining channels) increased resistance against attacks. Perceptual transparencies and capacity ratio of the proposed algorithm are compatible with the other four algorithms. A. Beimel, "Secret-Sharing Schemes: A Survey," in Coding and Cryptology, 2011, pp. 11-46. A. Shamir, "How to Share a Secret," Commun. ACM, vol. 22, no. 11, pp. 612-613, Nov. 1979. A. Cheddad, J. Condell, K. Curran, and P. Mc Kevitt, "Digital image steganography: Survey and analysis of current methods," Signal Processing, vol. 90, no. 3, pp. 727-752, Mar. 2010. C. Kurak and J. McHugh, "A cautionary note on image downgrading," in  Proceedings Eighth Annual Computer Security Application Conference, 1992, pp. 153-159. I. S. Moskowitz, G. E. Longdon, and L. Chang, "A new paradigm hidden in steganography," in Proceedings of the 2000 workshop on New security paradigms, 2001, pp. 41-50. T. Sharp, "An Implementation of Key-Based Digital Signal Steganography," in Information Hiding, 2001, pp. 13-26. E. Kawaguchi and R. Eason, "Principle and applications of BPCS-Steganography," in Principle and applications of BPCS-Steganography, Boston,USA, 1998, vol. 3528, pp. 464-473. W. Bender, D. Gruhl, N. Morimoto, and A. Lu, "Techniques for data hiding," IBM Systems Journal, vol. 35, no. 3.4, pp. 313-336, 1996. I. S. Moskowitz and N. F. Johnson, "A detection study of an NRL steganographic method," NAVAL RESEARCH LAB WASHINGTON DC, 2002. M. Noto, "MP3Stego: Hiding text in MP3 files," Sans Institute, p. 5, 2001. N. F. Johnson and S. Katzenbeisser, "A survey of steganographic techniques," in Information hiding, 2000, pp. 43-78. L. Zhi, S. A. Fen, and Y. Y. Xian, "A LSB steganography detection algorithm," in Personal, Indoor and Mobile Radio Communications, 2003. PIMRC 2003. 14th IEEE Proceedings on, 2003, vol. 3, pp. 2780-2783. Jessica Fridrich and Miroslav Goljan, "Digital image steganography using stochastic modulation," 2003, vol. 5020, pp. 5020-12. R. O. El Safy, H. H. Zayed, and A. El Dessouki, "An adaptive steganographic technique based on integer wavelet transform," in 2009 International Conference on Networking and Media Convergence, 2009, pp. 111-117. C.-C. Chang, T.-S. Chen, and L.-Z. Chung, "A steganographic method based upon JPEG and quantization table modification," Information Sciences, vol. 141, no. 1, pp. 123-138, Mar. 2002. R. Chu, X. You, X. Kong, and X. Ba, "A DCT-based image steganographic method resisting statistical attacks," in Acoustics, Speech, and Signal Processing, 2004. Proceedings.(ICASSP'04). IEEE International Conference on, 2004, vol. 5, pp. V-953. M. Hussain and M. Hussain, "A survey of image steganography techniques," 2013. C.-K. Chan and L. M. Cheng, "Hiding data in images by simple LSB substitution," Pattern Recognition, vol. 37, no. 3, pp. 469-474, Mar. 2004. Y. K. Lee and L. H. Chen, "High capacity image steganographic model," IEE Proceedings - Vision, Image and Signal Processing, vol. 147, no. 3, pp. 288-294, Jun. 2000. R.-Z. Wang, C.-F. Lin, and J.-C. Lin, "Image hiding by optimal LSB substitution and genetic algorithm," Pattern Recognition, vol. 34, no. 3, pp. 671-683, Mar. 2001. S.-H. Liu, T.-H. Chen, H.-X. Yao, and W. Gao, "A variable depth LSB data hiding technique in images," in Machine Learning and Cybernetics, 2004. Proceedings of 2004 International Conference on, 2004, vol. 7, pp. 3990-3994. C. E. Shannon, "Communication theory of secrecy systems," The Bell System Technical Journal, vol. 28, no. 4, pp. 656-715, Oct. 1949. W. Wong, L. Lee, and K. Wong, "A Modified Chaotic Cryptographic Method," in Communications and Multimedia Security Issues of the New Century: IFIP TC6 / TC11 Fifth Joint Working Conference on Communications and Multimedia Security (CMS'01) May 21-22, 2001, Darmstadt, Germany, R. Steinmetz, J. Dittman, and M. Steinebach, Eds. Boston, MA: Springer US, 2001, pp. 123-126. A. Kanso and N. Smaoui, "Irregularly decimated chaotic map (s) for binary digits generations," International Journal of Bifurcation and Chaos, vol. 19, no. 04, pp. 1169-1183, 2009. A. Kanso, H. Yahyaoui, and M. Almulla, "Keyed hash function based on a chaotic map," Information Sciences, vol. 186, no. 1, pp. 249-264, 2012. A. Kanso, "Self-shrinking chaotic stream ciphers," Communications in nonlinear science and numerical simulation, vol. 16, no. 2, pp. 822-836, 2011. X. Wu and Z.-H. Guan, "A novel digital watermark algorithm based on chaotic maps," Physics Letters A, vol. 365, no. 5-6, pp. 403-406, 2007. S. Behnia, M. Teshnehlab, and P. Ayubi, "Multiple-watermarking scheme based on improved chaotic maps," Communications in Nonlinear Science and Numerical Simulation, vol. 15, no. 9, pp. 2469-2478, Sep. 2010. M. Keyvanpour and F. Merrikh-Bayat, "An Effective chaos-based image watermarking scheme using fractal coding," Procedia Computer Science, vol. 3, pp. 89-95, Jan. 2011. L. Yu, Y. Zhao, R. Ni, and T. Li, "Improved Adaptive LSB Steganography Based on Chaos and Genetic Algorithm," EURASIP Journal on Advances in Signal Processing, vol. 2010, no. 1, p. 876946, Jun. 2010. A. Kanso and H. S. Own, "Steganographic algorithm based on a chaotic map," Communications in Nonlinear Science and Numerical Simulation, vol. 17, no. 8, pp. 3287-3302, Aug. 2012. R. Roy, A. Sarkar, and S. Changder, "Chaos based Edge Adaptive Image Steganography," Procedia Technology, vol. 10, pp. 138-146, Jan. 2013. S. Ahadpour and M. Majidpour, "Image Steganography Using Discrete Cross-Coupled Chaotic Maps," 2013. M. Ghebleh and A. Kanso, "A robust chaotic algorithm for digital image steganography," Communications in Nonlinear Science and Numerical Simulation, vol. 19, no. 6, pp. 1898-1907, Jun. 2014. M. Y. Valandar, P. Ayubi, and M. J. Barani, "A new transform domain steganography based on modified logistic chaotic map for color images," Journal of Information Security and Applications, vol. 34, pp. 142-151, Jun. 2017. G. Sathishkumar, D. N. Sriraam, and others, "Image encryption based on diffusion and multiple chaotic maps," arXiv preprint arXiv:1103.3792, 2011. 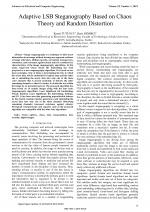 B. Y. Ryabko, V. S. Stognienko, and Y. I. Shokin, "A new test for randomness and its application to some cryptographic problems," Journal of Statistical Planning and Inference, vol. 123, no. 2, pp. 365-376, Jul. 2004. A. Westfeld and A. Pfitzmann, "Attacks on Steganographic Systems," in Information Hiding, 2000, pp. 61-76. Zhou Wang, A. C. Bovik, H. R. Sheikh, and E. P. Simoncelli, "Image quality assessment: from error visibility to structural similarity," IEEE Transactions on Image Processing, vol. 13, no. 4, pp. 600-612, Apr. 2004. 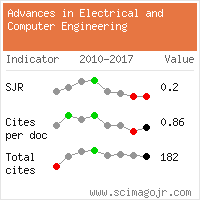 Citations for references updated on 2019-04-18 22:37 in 245 seconds. Website conception, design and maintenance by Eugen COCA. Content updated on 28 Feb 2019. Site engine updated on 28 Feb 2019. This page was generated on the server in 0.061 seconds and loaded in your browser in > seconds.